H is for Half Pipe, as in the snowboarding sports event. 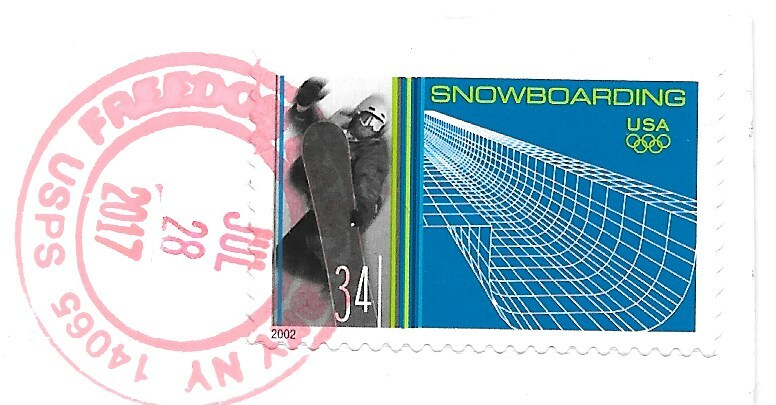 Here the winter sport event is featured on a stamp celebrating the Salt Lake City winter games held in 2002. 34c was the first class rate back then, last year 34c was the domestic postcard rate (this year it went up 1c to 35c). To see more stamps with an H theme, check out the links at Sunday Stamps. That is a cool design, the half-pipe! I am surprised the post office hasn't scrapped it - I don't see how it is profitable. 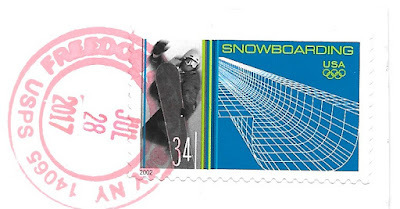 And fun to learn something through stamps, for sure. The running joke here seems to be "what a nice winter we're having this spring"! Interesting view. I imagine these sportspeople have amazing spatial awareness.